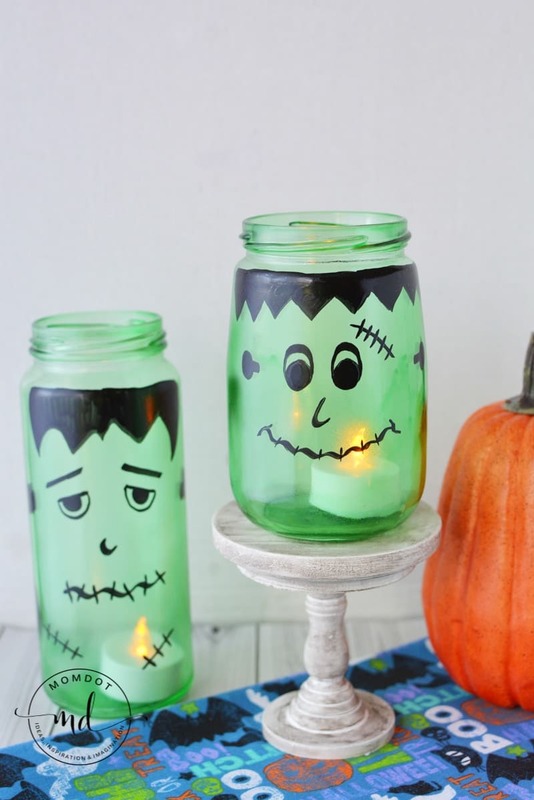 Mason jars is probably one of the easiest and most beautiful ways to make Halloween Decor and making Halloween luminaries should be at the top of your list! 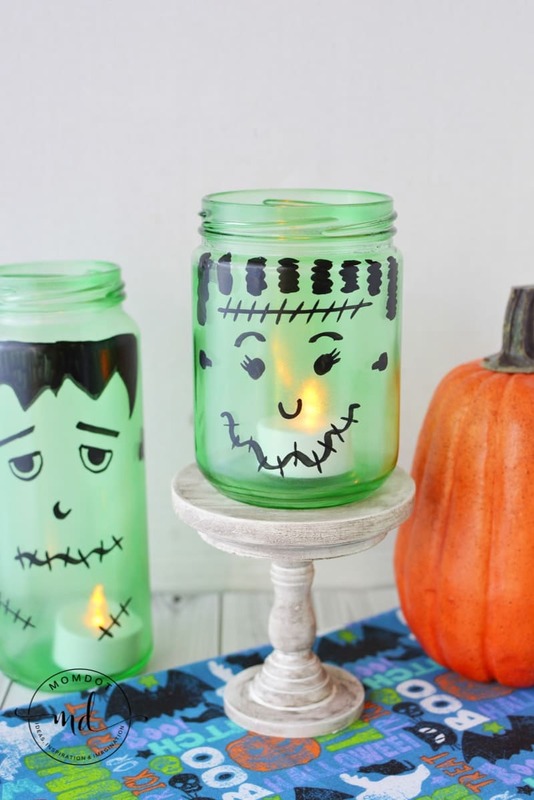 Easily added to tables, fireplace mantels and even bedroom dresses, these Halloween mason jar luminaries are a perfect way to light up the room. 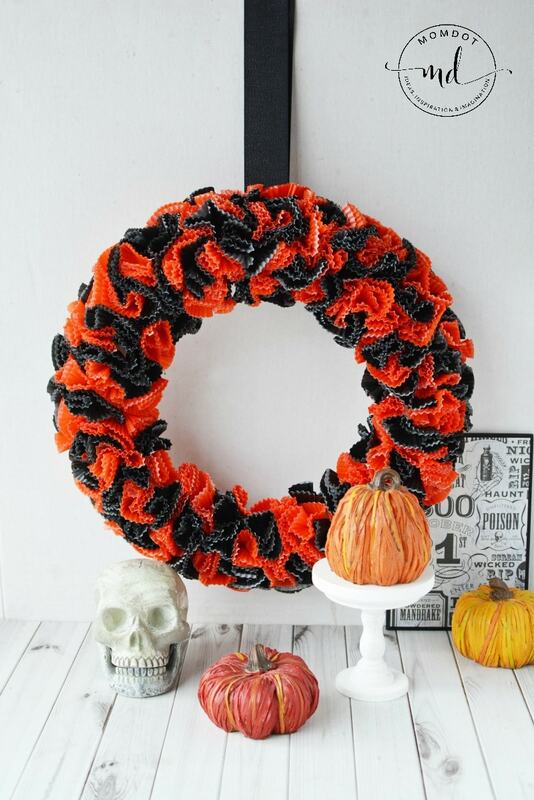 Plus, this is a kid friendly craft with a little prep! If you need another really great kid friendly craft, you can also grab this Mad Scientist Halloween Slime Recipe! Its perfect to add right into these jars…without the candle of course. See below for full mason jar luminary tutorial. Before you get started on your luminary tutorial, you will need a few things. In this craft we use a black paint pen, so depending on your childs age, you can easily allow them to have some fun making faces for your Frankenstein’s! Just do all the preliminary painting. The color that is used is listed, but feel free to change up the colors of the jars, including white for ghosts and orange for pumpkins. This is a super fun craft with endless possibilities. Also I never use real candles in jars. Just go ahead and stock up on the battery operated tea lights, which you can use year round. Clean and dry the jars well. Try to avoid over handling the jars as the oils from your hands will prohibit an even coating of spray paint. Read all directions on the spray paint can. Place the jars, upside down onto a flat and protected surface in a well ventilated area. Paint the jars, about 2-3 coats total, making sure to dry between coats or according to the package directions. Once jars are dry, draw onto the jars with the paint pen. The pen may show streaks, and you can go over the black areas a second time when the first layer is dry to make it darker and more opaque. Once finished, let set to dry completely according to package directions. Place 1 reusable tealight into each jar and display. Look how cute your jars are when you turn off the lights!